(This blog is offered free of charge to anyone interested in hearing SP 500 earnings related thoughts / opinions, so be sure and “subscribe” if you wish to get this blog via email anytime there is anything new posted. These are personal market opinions that are posted for the benefit of readers after 23 years of serving both high-net-worth individuals and regular investors looking for a more in-depth relationship with their investment advisor. The opinion’s detailed here are not predictions, nor advice, but there is guidance on what is being done for clients (or has been done) and readers are free to follow along and ask questions (or not)). The genius of Twitter for those in the investing / capital markets business, is that a reader can scan a tremendous amount investment-related posts in a short amount of time. There is a lot of junk, but if you follow the right folks, there is much value-added too. This is a great post from Larry McDonald, who writes “The Bear Traps Report” as well. If you aren’t following Mr. McDonald on Twitter (@convertbond) you absolutely should be, giving the quality of his work. 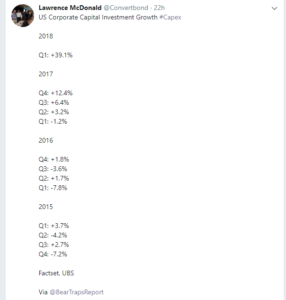 The Advance (first look) Q1 ’18 GDP report released Friday morning, April 27th, 2018, showed that Business Investment was outpacing (or outpaced) Consumption for Q1 ’18 (at least so far) and then I saw this tweet from @convertbond which shows the sharp acceleration in “capex” for Q1 ’18, it was a comforting aspect to the GDP report. This surge in business investment / capex may also be why the first quarter of 2018, was stronger than other years, as tax reform freed up cash for longer-term investment. “Capex” or capital investment isn’t a well understood financial term by retail investors. The account profession defines “capital investment” as the capital expenditures required to sustain the economics of a business. A good example over the last 40 – 50 years is Ford and GM, and the auto plant retooling and upgrading of the manufacturing business. I look at it more simply as the basic spending required to produce a product or service that you offer. The interesting thing is that readers won’t find “capex” on the income statement. It’s found on the Statement of Cash Flows under “Cash generated by Investing activities”. What’s even more interesting is that in industries like Pharmaceutical and Technology, so much of what might be otherwise considered “capex” (i.e. salaries devoted to R&D that are expensed) is likely understating EPS power and potentially overstating free-cash-flow. That is pretty wonky stuff though and well beyond the scope of this blog. However the point being that – all other things being equal – I can’t see how this “investment” today isn’t a substantial positive for the US economy. Although I assiduously avoid most political discussions, given there is always more downside than upside with the discussions, discussions with clients after the Financial Crisis always led me to caution that government policy – as it stood then – was casting a bit of pall over corporate Board’s and CEO’s. You could read it in the quarterly earnings reports, after tax hikes in 2012, and worries over budget deficits that might require additional tax revenue. Plus, it was safe to assume, with the banking system bottled up tight, we could probably assume less corporate lending was being done, although I don;t have the stats to back that up. The point is that this Q1 ’18 investment could also be “deferred investment” until Corporate Boards and CEO’s saw a clearer field to investment in projects with a longer payoff horizon. In its simplest form, the basic formula for GDP is (C)onsumption + (I)nvestment + (G)overnment Spending + (Exports – imports), so “Investment” and particularly Business Investment matters to the US economy. Larry McDonald gets our “tweet of the week” award and he has a few others too that might be worth a blog post.